Explanation: This is not a scene from a sci-fi special effects movie. 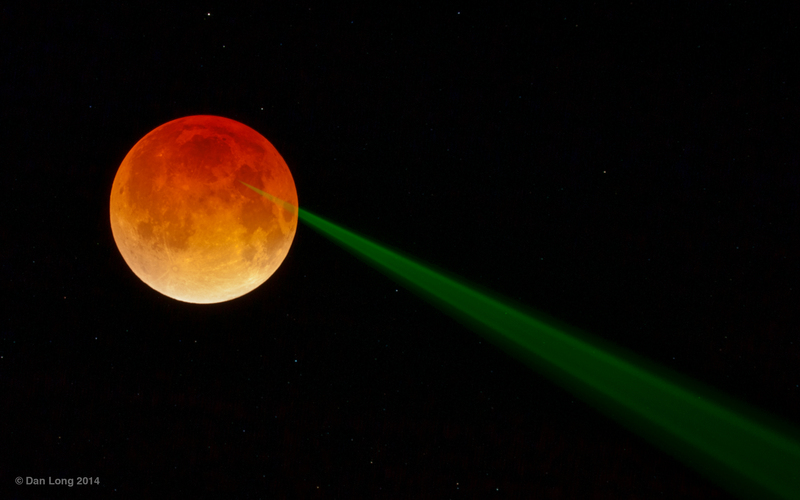 The green beam of light and red lunar disk are real enough, captured in the early morning hours of April 15. Of course, the reddened lunar disk is easy to explain as the image was taken during this week's total lunar eclipse. Immersed in shadow, the eclipsed Moon reflects the dimmed reddened light of all the sunsets and sunrises filtering around the edges of planet Earth, seen in silhouette from a lunar perspective. But the green beam of light really is a laser. Shot from the 3.5-metre telescope at Apache Point Observatory in southern New Mexico, the beam's path is revealed as Earth's atmosphere scatters some of the intense laser light. The laser's target is the Apollo 15 retroreflector, left on the Moon by the astronauts in 1971. By determining the light travel time delay of the returning laser pulse, the experimental team from UC San Diego is able to measure the Earth-Moon distance to millimetre precision and provide a test of General Relativity, Einstein's theory of gravity. Conducting the lunar laser ranging experiment during a total eclipse uses the Earth like a cosmic light switch. With direct sunlight blocked, the reflector's performance is improved over performance when illuminated by sunlight during a normal Full Moon, an effect fondly known as The Full Moon Curse.